Generic Lamisil Tablets (Terbinafine Hydrochloride tablets) are used to treat Fungal infections of the skin, which includes the treatment of tinea corporis, tinea cruris, tinea pedis, and yeast infections of the skin caused by the genus Candida where oral therapy is generally considered appropriate, owing to the site, severity or extent of the infection. Terbicip tablets are also used to treat infections caused by Tinea capitis and Onychomycosis (fungal infection of the nails) caused by dermatophyte fungi. The active ingredient present in Terbicip Tablets is Terbinafine Hydrochloride. Generic Lamisil tablets are available as Corbinal, Zabel, Terbisil, Zebifin, Zimig, Daskil and Fungotek. Terbicip tablets, manufactured by Cipla Ltd., are available in strengths of 250 mg. We also have in stock Generic Lamisil Cream (Terbicip Cream by Cipla) which also contains the same active ingredient Terbinafine Hydrochloride. We supply original Terbicip tablets manufactured by Cipla Ltd.. The active ingredient present in Terbicip tablets is Terbinafine Hydrochloride. Each uncoated tablet of Terbicip contains Terbinafine Hydrochloride equivalent to Terbinafine 250 mg.
Generic Lamisil tablets is used to treat fungal infections on the fingernails and on the toenails (also known as onychomycosis) caused by fungus tinea unguium. Terbicip 250 mg tablets by Cipla antifungal tablets are also used to treat rignworms on the scalp and fungal infections in the hair follicles. We supply Terbicip manufactured by Cipla which is also known as Generic Lamisil. The active ingredient is Terbinafine Hydrochloride and it is supplied in 250 mg tablets. We also offer Terbicip as a cream base. The recommended dosage of Generic Lamisil tablets (Terbicip by Cipla) for adults is One tablet of Terbicip 250 mg once a day. The length of treatment varies according to the type of infection and the severity of the infection. Tinea pedis (interdigital, plantar/moccasin type) : 2 to 6 weeks. For most patients the duration of successful treatment is 6 to 12 weeks. 6 weeks of therapy is sufficient for fingernail infections in most cases. 12 weeks of therapy is sufficient for toenail infections in most cases. Some patients with poor nail outgrowth may require treatment for longer duration. The optimal therapeutic effect is seen some months after mycological cure and stopping of treatment. This is related to the period required for the outgrowth of healthy nails. You should take Terbinafine HCl tablets (Generic Lamisil) at the same time every day or you would otherwise have peaks with high or low levels of the medication in your body. This way you obtain the highest efficiency of the medication and maintain a constant level of the active ingredient being absorbed into your body and blood stream. You are also likely to experience less potential side effects. If you forget to take your medicine then take it as soon as possible. However, skip the forgotten dosage if it is almost time for your next normally scheduled dose as you should never take a double dose of Generic Lamisil tablets even if you forget to take your medication for several days. Taking a double dose or taking two doses within a short period of time may increase side effects and other health risks while there are no increased benefits. Terbicip (Terbinafine Hydrochloride tablets) is usually taken once daily for 6 to 12 weeks. Take the tablet with a full glass of water. Terbicip Tablets are contraindicated in individuals with hypersensitivity to Terbinafine HCl or to any inactive ingredients of the medication. The most commonly reported side effects during treatment with Terbinafine HCl tablets (Generic Lamisil) were gastrointestinal symptoms (including diarrhea, dyspepsia, and abdominal pain), liver test abnormalities, rashes, urticaria, pruritus, and taste disturbances. In general, the side effects were mild, transient, and did not lead to discontinuation. • unusual or unpleasant taste in your mouth. This is not an exhaustive list of all potential side effects of Generic Lamisil tablets and you may experience other side effects. If you experience other side effects that bother you then contact your doctor or pharmacist and explain the symptoms in detail. They may be able to help you. Terbicip tablets (Generic Lamisil) may not be safe or suitable for all patients and you may need dose adjustments to get the optimal level of the active ingredient. Always make sure to tell your doctor if you are pregnant, if you intend to become pregnant, or if you are breastfeeding. You must inform your doctor about any and all medication you are currently taking of has been taking within the last month. This includes prescription medication as well as non-prescription medication (commonly known as OTC or Over-The-Counter), herbal medication, vitamins, and other health supplements. Do not start on a new medication without consulting your doctor or pharmacist about potential drug interactions. Your doctor or pharmacist also needs to know about any allergies you have and if you have other illnesses or medical conditions. You should avoid consuming any product containing caffeine such as tea and coffee while taking Terbicip tablets (Generic Lamisil). Further, sunlight exposure and tanning beds should be avoided as you will easily get sunburned while taking Terbicip tablets. Terbinafine HCl tablets have been classified by the US FDA as Pregnancy Category B. Foetal toxicity and fertility studies conducted in animals have suggested no adverse effects. There is no clinical experience with Terbinafine HCl in pregnant women; hence, unless the potential benefits outweigh any potential risks, Terbicip tablets should not be administered during pregnancy. Terbinafine HCl is excreted in breast milk; therefore, mothers receiving oral treatment with Terbicip Tablets should not breastfeed. You can buy Generic Lamisil tablets (Terbinafine HCl pills) online from Clear Sky Pharmacy. Terbicip 250 mg pills, manufactured by Cipla Ltd., India are supplied in a box with 7 tablets. 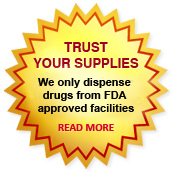 The 250 mg tablets cost only $1.12 per unit when you place an order for 112 tablets.